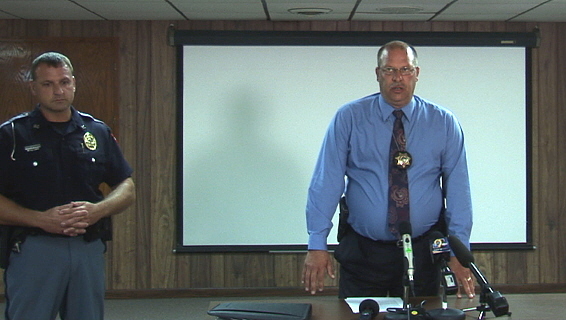 The Grant Co. Sheriff's Department held a press conference Wednesday to provide details of the charges against James Kruger, and a description of the events leading to his arrest. James M. Kruger, 36, Madison, Wis., is charged with being a felon in possession of firearms. The indictment alleges that on September 10, 2013, Kruger possessed a .22 caliber double-barreled firearm, a loaded 9mm semi-automatic handgun, and a loaded 12 gauge shotgun. Kruger was arrested on September 10. If convicted, Kruger faces a maximum penalty of 10 years in federal prison. The charge against him is the result of an investigation by the Grant, Iowa and Dane County Sheriffs’ Departments; Bureau of Alcohol, Tobacco, Firearms and Explosives; and Cassville, Dodgeville, Fennimore and Platteville Police Departments. The prosecution of this case has been assigned to Assistant U.S. Attorney Timothy M. O’Shea. Update - 3:49 p.m. - Kruger went to a residence in the Village of Cassville and assaulted the male subject and took several guns from the residence. Kruger left the residence and it was reported to the Grant County Sheriff’s Dept. that shots were fired south of Cassville. A search for several hours was conducted. At about 11 a.m. the Sheriff’s Dept. received a call from a female reporting a kidnapping. Kruger went to a residence outside of Cassville and took a male subject hostage and pointed a gun at the female. Kruger took the male subject’s vehicle and cattle trailer along with a male subject at gun point and left the residence. The cattle trailer was later unhooked alongside a back road. The male subject was released in the City of Dodgeville unharmed. After a high speed chase Kruger was taken into custody in Dane County. The victim's names are not being released at this time. Charges are pending. Update - 1:55 p.m. - James M. Kruger is in custody at this time. More to follow. Grant County, WI - September 10, 2013, 10:23 a.m. - Law Enforcement Officers are searching for a James M. Kruger, 36 years old. He is wanted on attempted homicide charges from Madison Police Department as well as charges from Platteville Police dept., and the Grant County Sheriff's office. Kruger is considered armed and dangerous. If seen, the public should not attempt to make contact and should seek safety and contact the Law Enforcement by dialing 911. Kruger was last sighted south of Cassville, WI at 7:15 a.m. He has a 2011 Black Honda Civic two door with white decals. License number 546-UWN (Wisconsin registration).